We Support Our Stars & Stripes! At SAFE Haven, we support our Stars and Stripes. There’s no way we can fully say thank you to the more than 112,951 active military and over 790,000 veterans who have served the United States and call North Carolina home. There aren’t enough words. 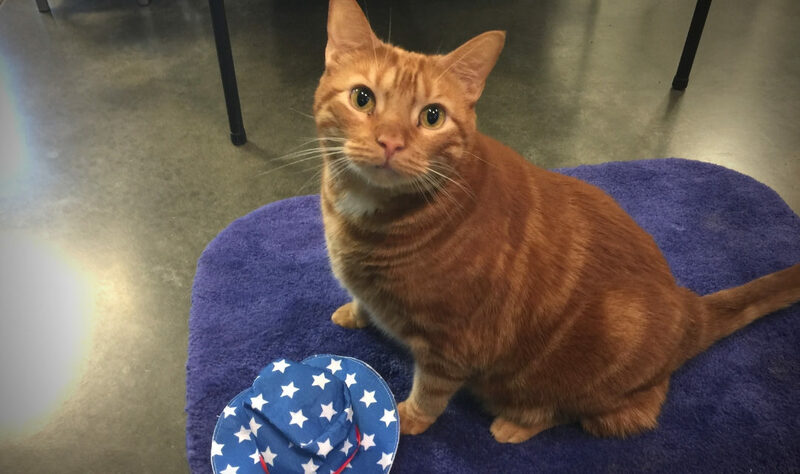 What we can do is offer our military cat lovers a special Stars & Stripes package in appreciation for your service. When you mention the Stars & Stripes Package during scheduling and show us your military ID, you will pay only $25 for the spay/neuter surgery package, which includes an exam, pain medication, microchipping, and vaccines. Spaying and neutering cats can help reduce the population of more than 100,000 cats living without a home in the Triangle. Fighting to reduce this number is a major part of our mission. We support spay/neuter as a means to control overpopulation and reduce euthanasia among cats. Call 919.872.7730 and tell us you want the Stars & Stripes Package. The Fine Print: Discount only provided when valid US Military ID presented at check-in. Limit 2 cats per military ID. SAFE Care reserves the right to decline surgery on a cat with significant risk factors (age, weight, chronic conditions). Offer expires on December 31, 2019.